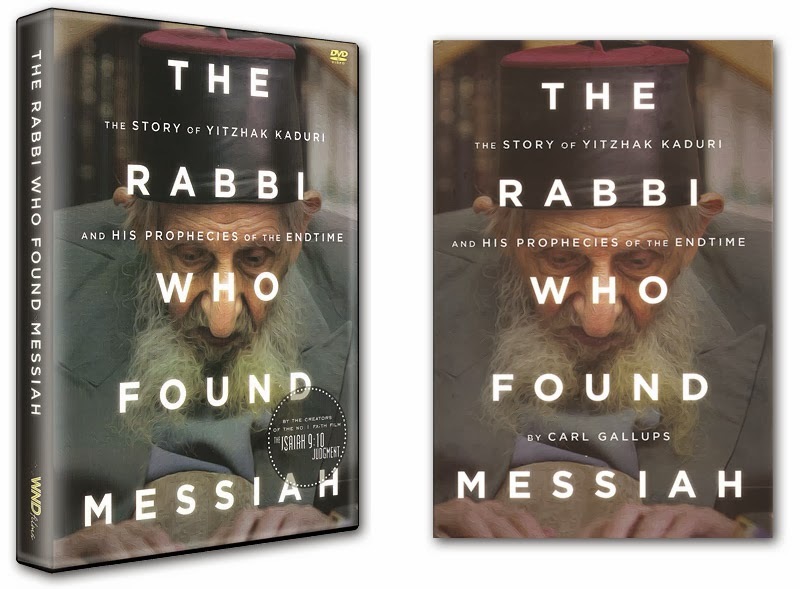 Nathan Jones: Carl, I think the key to understanding this topic about the rabbi who found Messiah is for us to look at how the Jewish people reacted to Kaduri's message. Tell us, how have the Jews reacted? Are they embracing the message, or are they hating it? Are you getting hate mail because of you exposing this story? Carl Gallups: Many of the Orthodox Jews of course are trying to shun Kaduri's message. Remember the Jewish media even shut it down. Yitzhak Kaduri was the Billy Graham of Jews, if you will. He was the leading voice for Rabbinical Orthodox Judaism. Then his note was opened and posted on his website for the whole world to see, which I think was brilliant by the way. What if Kaduri had just taught that Jesus is the Messiah secretly, and then got up and by mouth proclaimed, "Jesus is Messiah"? He would have been shut down instantly, and there would have been no evidence and we'd never hear of it again. But, Kaduri chose to present the revelation in a way where the whole world could see. Now it's in a book, a movie, the whole world can see it, so there's nothing the Orthodox Jews can do about it. Believe me, Jews not happy about Kaduri's revelation. I've gotten plenty of hate mail over this. Dr. Reagan: I would think so. That would be like Billy Graham saying Mohammed is the Messiah. Carl Gallups: Yes. It's easy to imagine then why Christians would not be too happy about that. But, we of course have other proof, because we know about the death, burial, crucifixion and through prophecy that Jesus is Messiah. Carl Gallups: Since my book and movie on Kaduri's note have been released in Israel, carts and cases of the books and movies are being given away in the streets of Haifa, Tel Aviv, and in the Old City of Jerusalem, even at the Wailing Wall. Nathan Jones: Wow, that's awesome! Carl Gallups: What's happening there is miraculous and astounding. By the way, the movie that was made from the book is being shown in churches all over America, too. Also, we found out through an operative in Israel that ten of Kaduri's students are now on record stating they are born again Christians, believers in Jesus Christ as Lord, because of Kaduri's teaching in his yeshiva. Yeshiva is the Hebrew word for a seminary. Now that my movie has been shown to them, Kaduri's students are overjoyed because they now feel vindicated. Shortly after the Kaduri note was put online, a gentleman by the name of Zev Porat came forward. Zev was born and raised in Israel. His father and both his grandfathers were rabbis. One of his grandfathers was a Holocaust survivor, and one even knew Kaduri personally. So, you can guess what Zev was getting ready to be — a rabbi. Carl Gallups: Here's Zev's testimony. Years ago he was surfing a Christian website, similar to Lamb & Lion's website at lamblion.com, and he was reading the site's claims about Jesus and the Old Testament. He then started comparing what these Christians said with his own Jewish beliefs. To make a long story short, Zev became a born again believer in Jesus Christ. Through the years Zev has built a solid foundation in the Word and become a great evangelist to the Jews. The desire of his heart is to take the gospel to his Jewish brothers. He has been rejected by his family and the Orthodox community due to his faith in Jesus Christ, but he and his wife, Lynn, continue to take the Gospel into the streets. Zev told me that he knew about the Kaduri story and what had happened. The media had shut it down and the rabbis were not talking about it. 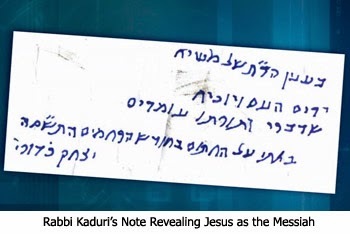 If anyone dared mention anything about Kaduri's note, the rabbis would say, "That's a lie! That's a lie!" But, Zev knew it wasn't a lie, and so he and his wife got down on there knees and started praying that somehow they would get the materials to prove it. Literally while they are praying, they heard a knock at the door. Standing there was a man from the United States. He had brought them all my books and movies about Kaduri. The man said, "God says you need this stuff." Zev was astonished! At that time I hadn't met Zev yet, but I later talked about him in my book and even include videos of him in the movie. Nathan Jones: Zev also has a website people can visit, right? Carl Gallups: Yes, it's messiahofisraelministries.org. That guy is amazing, so check his site out. So, Zev gets the materials, and then tries to make contact with me. He starts calling me every day and writing to me and saying, "Carl, you're not going to believe this. There's a Kaduri revival in Israel." Zev told me, "After I got the materials, I took the book with me on a train and started reading it aloud. Before the hour-long trip was over, literally half the train was sitting at my feet." Dr. Reagan: The story's like a magnet. It draws people in. Carl Gallups: Exactly! It would be like if you had a brand new book by Billy Graham with his picture on the front. Anywhere you went people would say, "That's Billy Graham. Is that a new book?" Same thing with this book, except there had been no books written about Kaduri before, so when these passengers saw it, they were freaking out. They gathered around Zev. He said he opened my book and showed them the picture of the note that said when decoded, "Jesus is Messiah." They all said, "We didn't know this! How come we didn't hear about this?" We even have an elderly Orthodox Jew on video, who after Zev had gone through the Old Testament and the New Testament and had shown them the rabbi's note, looks at Zev and says, "If this is true, and obviously it is, then the media and the rabbis are keeping me from salvation." Zev said to him, "My brother, only the Holy Spirit would reveal that to you. You're absolutely right." Dr. Reagan: Zev uses this opportunity to take them right through Scriptures and through the prophecies in the Old Testament, which is so important as you pointed out, because the average Jew and rabbi do not know the Scriptures. They've spend their whole lives studying commentaries on the Scriptures. Carl Gallups: That's right. They read the Zohar, the Kabbala, the Talmud and the Mishnah. They listen to their rabbi's interpretation of the Scriptures, but those interpretations are just snippets of Scripture. Dr. Reagan: So, when Zev showed them scriptures like Isaiah 53, they probably didn't even know it existed. Carl Gallups: Yes. They'd never heard scriptures such as Psalm 22, Isaiah 53, Zechariah 12, or Job 19. They didn't know any of the scriptures that speak of the Redeemer, the Messiah, about the piercing of His hands and feet, or Psalm 16 which talks of the rising after three days. If they'd know of these Scriptures, they had heard them with a rabbinical twist which changed the meaning away from the Messiah. After the people had seen the note that this "Billy Graham of the Jews" had declared, and after Zev had shown them how it all fit together with the biblical scriptures about the Messiah, they were amazed. The most visually astounding story Zev told me about was one that happened at the Wailing Wall. Dr. Reagan: Oh, yes. I've seen this on video. It's just unbelievable! Carl Gallups: Zev takes the book, along with an Old Testament and New Testament, to the Wailing Wall. Now, Zev is an Orthodox Jew, and most of the people there know that he's a believer in Jesus. And so, he goes to the Wailing Wall, though I don't know if what he did was illegal, but I imagine it was a couple hundred years ago. He probably would have been stoned back then. But anyways, Zev goes to the Wailing Wall with my book. All the Jews see it. They see Kaduri's picture on the front, so interested they crowd around him and ask, "What's this book?" Zev answers, "Let me show you what Kaduri said." They all listen and they're all like, "What? That can't be true because we would have heard about it." Then Zev tells them how the media and the rabbis had shut the story down. I'd imagine there were rabbis even listening to all of this at the Wailing Wall. The last story Zev told me was about a man named Jonathan who was standing at the Wailing Wall and listening to all that Zev was telling the people. He walks up and says to Zev, "Tell me more about this." So, Zev takes him through the Old Testament, through passages like Psalm 22, Zechariah 12 and Isaiah 53. Then he gets into the New Testament and shows how Jesus fulfilled His promises and how all the New Testament documents are written by Jews. There's even a book called Hebrews written specifically for Jews to show them that Jesus is Messiah. The next thing Jonathan asks is, "How can I be saved? How can I know Jesus?" We have a picture of Jonathan with his arms up on the Wailing Wall giving his life to Jesus Christ. So, you can see right there the impact Kaduri's note has made on the Jewish people. Sadly though, even with all these evidences of salvation, still we'll have detractors about the viability of Kaduri's note's impact. Listen, my whole life is about advancing the Kingdom of Jesus Christ. This story needed to be told, and if people don't like it, that's because they don't get it. If people are going to make judgments on the story before they read my book, then shame on them. The bottom line is — I'm not Kaduri's publicist nor his apologist. I'm not his spokesperson. There's a story that needed to be told, and I have told it. It has made its way into Israel and multitudes of Orthodox Jews are being saved right now through Zev Porat's ministry and though my book and movie. I give God all the glory! This is genuine, prophetic, end time stuff that is happening today. It could very well be that Jonathan is the first Jew in 2,000 years to have been saved at the Wailing Wall. I'm just thrilled to be a little part of this! 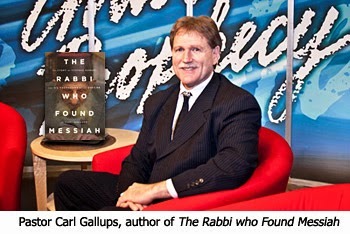 In the fourth segment of our interview with Pastor Carl Gallups on the criticisms of the Rabbi Kaduri story, he'll address two more. I disagree with the premise that this Rabbi named THE Jesus as the Messiah. He said the Messiah would be called Jesus. Subtle difference? Not really. If he was proclaiming THE Jesus to be the Messiah he would have described THE Jesus as He is known to be according to the Word of God. "What if Kaduri had just taught that Jesus is the Messiah secretly, and then got up and by mouth proclaimed, "Jesus is Messiah"? He would have been shut down instantly, and there would have been no evidence and we'd never hear of it again." We should all be thankful the Disciples of THE Jesus didn't follow such logic. They didn't keep silent! They proclaimed and defend the Lord Jesus to the point of death! If the Rabbi knew THE Jesus would he REALLY have kept quiet? Or would have become another Zola Levitt? Article: "By the way, the movie that was made from the book is being shown in churches all over America, too." The point is this note by the Rabbi is not what can nor will bring the Jews to Jesus. The Jews had Jesus in person and look what happened. The Jews have the Word of God and yet they still reject Jesus. Bible prophecy says it will take the Tribulation and the near descruction of the Jews to bring them to proclaiming Jesus as Lord. Don't get me wrong. It's good this note exists. It's good to know about it. But the focus of evangelism should ALWAYS be the Word of God which is the DEFINITIVE way to bring someone to Christ. The Bible will teach a person who Jesus truly is and a person can get to know THE Jesus. Article: "So, you can see right there the impact Kaduri's note has made on the Jewish people. Sadly though, even with all these evidences of salvation, still we'll have detractors about the viability of Kaduri's note's impact. Listen, my whole life is about advancing the Kingdom of Jesus Christ. This story needed to be told, and if people don't like it, that's because they don't get it. If people are going to make judgments on the story before they read my book, then shame on them." So...what is supposed to happen when the investigate further and discover the "Rabbi's Messiah" is actually a Messiah yet to come in the flesh as a man, one who will not know he is the Messiah, one who will "use the media" to get his message out...etc. And you say shame on us?! You throw stones at your fellow Christians for (gasp) having the gall to have an opinion and concerns and questions???!!! Article: "The bottom line is — I'm not Kaduri's publicist nor his apologist." Article: "So, you can see right there the impact Kaduri's note has made on the Jewish people. Sadly though, even with all these evidences of salvation, still we'll have detractors about the viability of Kaduri's note's impact." If you do reach some Jews and bring them to salvation then no one is arguing about that. No one is saying you can't use this a evangelist tool if you want that has potential to be beneficial. But DON'T attack other Christians for not agreeing with you 100% or having differing views. Thanks for the link, Diane. It reminded me of another of this Rabbi's sayings "Yeshua is already in Israel". With all the mischaracterizations of Jesus by this Rabbi you really wonder how this Pastor who wrote the book could say "Shame on you" if you're a Christian and you don't agree with him. Just to clarify again, as long as L&L takes a "we report, you decide" position of this particular book and issue then I am okay with L&L providing us with these articles. If they were to endorse it I would be very disappointed. Billy, Carl Gallups isn't attacking you or anyone else. People have asked questions about the veracity of his story, and he's merely answering them. People have wanted him to do this since the Kaduri story came out months ago. He'll also explain the Jewish view of the Messiah in an upcoming segment that should answer some of your concerns. I'll wait and see the rest of the articles before commetning more but my accusation of "attack", which is perhaps too strong a word choice but nonetheless, his quote "Shame on you" if you have an opinion without reading his book. I don't need to read his book to have an opinion about this subject. You really loaded your blog with quality material. Indeed, lots of great information and inspiration, both of which we all need. As a person who studies Torah and practices Messianic Judaism I am very exited about this tool to reach the Jewish people. All of the negative comments I hear are from those who are unfortunately ignorant about the subject they are speaking of. Our Messiah was Jewish, the talmidim (disciples) were Jewish, and our Bible is a Jewish document and was written to a Jewish audience. Many so called "Christians" do not even understand the basics of the root their faith was sprouted from. If they did, they would not make such ignorant comments. Yeshua stated himself that He would not return to Jerusalem until the JEWISH people cried Barukh haba bashem Adoani - Blessed is he who comes in the name of the LORD. I do not think that most Christians here in the west understand what a really big deal this is concerning this Rabbi in Israel. Gentile believers in Yeshua must give back to the Jews their Messiah - a Jewish Messiah and not the Hellenized version He has become to the rest of the world. The Gentile believer needs to treat the Jewish people as an older brother who has lost their way. The Gentile believer has gained everything because of the stubbornness of the Jewish people and do not forget that you are grafted into Israel and not the other way around. The Church has a very long history of anti-Semitic thinking that has corrupted the original message given to them. I think people need to educate themselves first before they start to throw rocks at something they do not understand. I applaud the efforts of the writer of this book and do not feel that he deserves all the hate that has been thrown his way. I rejoice in having a tool to use to reach Jewish people that can open the door to allow Yeshua in. Thank you Yah! Gentile in NT bible scripture means unbelievers or pagans. I am a Christian not a Gentile. Anne Christians have not taken Christ from the Jews so no need to have to give back. Your comments are offensive especially as a professed Messianic Jew. Shame on you. Once you replace negative thoughts with positive ones, you'll start having positive results. See the link below for more info.